You've made this exact statement before. Sure, yours might have involved more blaspheming, but the basic argument still existed—dark chocolate has no taste and is therefore evil. My main problem is that it even has the gaul to call itself chocolate. Sure, it does have the cacao in it, and in greater quantities than an edible chocolate bar, but when I hear the phrase “chocolate,” I think “yum,” but these abominations are very far from that. It doesn't taste right, it doesn't break right, it's just not chocolate. Milky Way Midnight is dark chocolate done right. There is a percentage where I'm completely okay with the darkness of chocolate. Up to 60 percent, and I'm great with it. It's not normal chocolate, but it has it's own unique charm and still tastes really good. But tick it up to even 61 percent and that sweetness turns to sour evil. Can't we call dark chocolate that's over 60 percent chocolate something else? Something like “Really Light and Ineffective Doorstop” or “Preventer of Kids from Eating Your Baked Goods.” A simple name change like this lowers expectations, no longer will someone expect something sweet that the chocolate name implies, they'll know exactly what they're getting with this altered name. Many people say they like dark chocolate for the health benefits of it. Something about how it prevents alcoholism or cures zombieism and definitely makes it so you cannot become an alcoholic zombie. Some even truly believe dark chocolate has health benefits. But it is technically candy, and anyone who eats candy for health related reasons, no matter how bad it tastes, has no idea what they're doing in the nutrition game. This brings us to the bizarre case study of Milky Way Midnight, which is, of course, the dark chocolate version of the Milky Way. Most people aren't enamored with the original Milky Way, were you to ask anyone to name their favorite candy bar, nobody would mention Milky Way as the far and away number one. 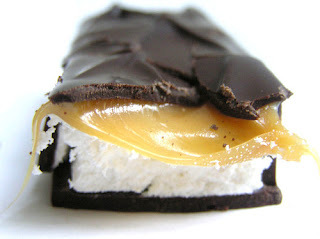 It's a passable candy bar that many other candy bars do much better. exception and not the rule. Many other candy bars, including Milky Way Midnight fill the role Milky Way would love to have. How does this work? First off, the Midnight edition probably isn't the highest percent cacao. It probably is just beyond the border of edibility. But there's also the amazing vanilla nougat that's not present in a normal Milky Way. The sweet vanilla melds with the more bitter chocolate in a fashion that both saves and elevates this creation. As people continue trying to “eat healthy” by eating dark chocolate, I hope more companies are swayed to create candy that actually tastes good. They should know the flavor profiles of dark chocolate and how to use it. Most of all, candy should taste good.